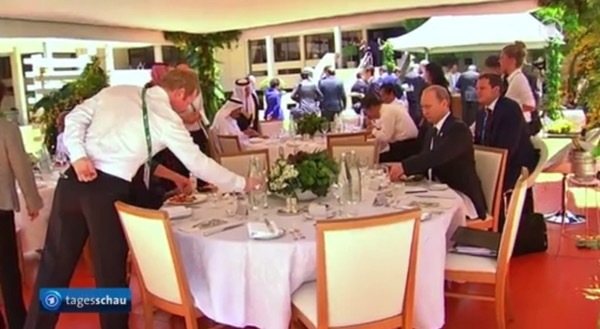 The pictures on French and German television showing Vladimir Putin all alone at his lunch table in Brisbane and explicitly meant to illustrate his alleged ‘isolation’ at the G20 summit were obviously fake. Dilma Roussef had already taken place at the other side of the table and both were waiting for other guests to join them. The desperate search of Western media to find ‘symbolic’ pictures to underpin their own wishful thinking reminds me of the mid-1980s, when Sting observed ‘a growing feeling of hysteria’ in both Europe and America, in his award-winning song ‘Russians’ (which would have been truly excellent without the simplistic refrain about the Russians’ love for the children…). I had just completed my military service in Bavaria, in a company that guarded nuclear Pershing missiles deployed in a forest nearby and aiming at Czechoslovakia. We knew very well that on the other side of the border the famous SS-20 missiles were directed at us. Very clearly, Sting was right to conclude that ‘there’s no such thing as a winnable war’. At the same time, I was also fully convinced that there was no way out of the vicious Cold War circle and the rhetoric of ‘mutual assured destruction’. Then, in June 1989, in my last year of studies, I was earning some money teaching intensive full-day German courses to American engineers who worked for Bosch automotive technology in Stuttgart. On 13 June, the nice young gentleman from South Carolina and myself were intrigued by the sirens out in the street and watched through the window the motorcade of black ZIL limousines heading towards the city centre. 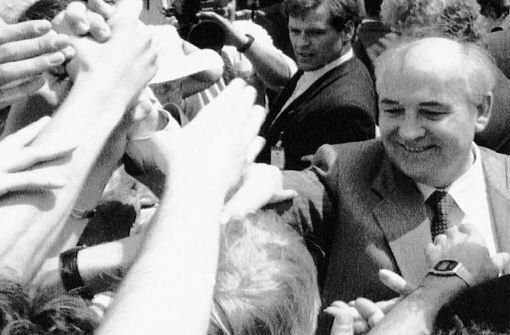 Coming down from Bonn, Mikhail Gorbachev and his wife Raissa were including a ‘study trip’ to Baden-Württemberg in their tour of what was still West Germany. Following a spontaneous inspiration, we stopped our grammar session and decided to go downtown to make a field study of contemporary German history. It turned out we were not the only ones: thousands of people had gathered on the Schlossplatz and were cheering ‘Gorbi! Gorbi!”, using a diminutive normally reserved to football stars like ‘Klinsi’, ‘Schweini’ or ‘Poldi’. When the General Secretary of the Central Committee of the Communist Party of the Soviet Union jumped out of his car and took what the Germans call ‘a bath in the crowd’, shaking hands and hugging babies, my poor American guest thought he was hallucinating (though probably less so than the Russian bodyguards). It is hardly surprising we had some trouble to resume our ‘normal’ German lessons again on that day. We both had the impression to have witnessed a totally unexpected watershed in history. And in retrospective, it probably was. Gorbatchev spent the rest of the day in Stuttgart University (with 50,000 people cheering along the drive to the campus, like at the Tour de France), while his wife chatted with a working class family from the automobile industry about living standards for the common people in Swabian capitalism, before leaving the next day for Dortmund and a meeting with the miners of the Ruhr. During his entire state visit, he was visibly very moved by the welcome and eager to share his emotions with his hosts, dumping his prepared speeches and talking about ‘reconciliation’ or ‘the pan-European house’ instead. The trip to Bonn, Stuttgart and Dortmund supplied the symbolic and emotional foundation of Gorbatchev’s acceptance of German reunification one year later. The part that the pictures and overall media coverage of this trip played in the process of German reunification cannot be overestimated. When Gorbatchev came back to Germany four months later, as guest of the 40th anniversary celebration of the GDR in East Berlin, he made it clear to Erich Honecker and his government that there would be no support for ‘those who do not react to life’. Ten days after the party, Honecker was history. Today, while Germany is celebrating the 25th anniversary of the opening of the Berlin Wall, Russia and ‘the West’ no longer argue about the reunification of Germany, but about the disintegration of Ukraine. Looking at the fake pictures of Putin from Brisbane, I can’t help but think we’re a long way off from another electric morning of change like the one on the Stuttgart Schlossplatz in June 1989. This entry was posted in Current Affairs, Global & International, Media & Communications and tagged Germany, Russia. Bookmark the permalink.